Complete dedication to what he saw as God’s will for him, dominates the life of John Baptist de LaSalle. 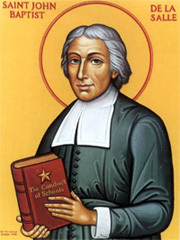 Founder of the Brothers of the Christian Schools, or Christian Brothers, he was canonized in 1900. In 1950 Pope Pius XII named him patron of schoolteachers. Saint John Baptist was born of the nobility of Rheims in 1651, and after a very pious youth was ordained a priest at the age of 27, becoming at once a Canon of the Cathedral there. It was said that to see him at the altar was sufficient to give an unbeliever faith in the Real Presence of Our Lord. The people would wait for him to come from the church to consult him. His life was marked by a rule he set for himself, to maintain perfect regularity in all his duties. Continue reading here. This entry was posted in Catholic Church, Saints and tagged Christian Brothers, Patron Saint of Teachers. Bookmark the permalink.